Time to get back to the tablet range of yesteryear: HP's TouchSmart line-up. They've added three new models to the family—the 12-inch tm2, 15.6-inch dv6t and 17.3-inch dv7t. At $950, the tm2 has a capacitive multitouch screen in the aforementioned 12 inches, a SU7300 1.3GHz ULV processor along with 3GB of DDR3 RAM and optional ATI Mobility Radeon HD 4550 card or SU9600 processor. 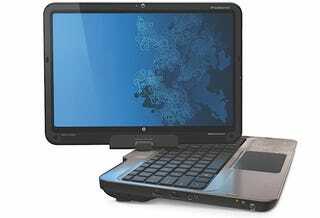 The larger 15.6-inch dv6t has a 2.4GHz Core i5-520M processor, 3GB RAM and 320GB HDD. It'll cost $929 when it goes on sale.